This presentation will show you how to “jumpstart your genealogy!” Learn the basics of how to investigate your family’s history using both traditional and online sources. Discover which records to tap into to identify your ancestral village, and how history impacts genealogical research. Tips for contacting possible relatives and writing to foreign archives, as well as strategies for overcoming the most common pitfalls and problems will also be discussed. Lisa A. Alzo, M.F.A., is a freelance writer, online instructor, writing coach, and internationally recognized lecturer, specializing in Eastern European research and nonfiction writing. She is the author of eleven books and hundreds of magazine articles. 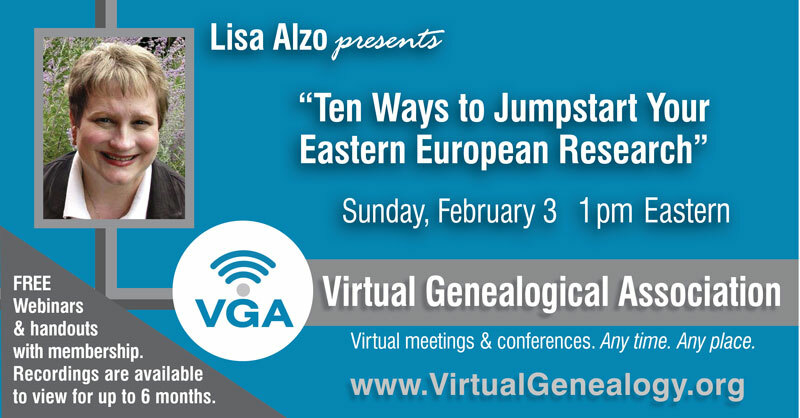 To register for this members-only webinar, visit https://virtualgenealogy.org/members/webinar-registration/ (must be logged in to access this page) and click the registration link beneath this webinar’s listing.